Inventory of major proportions that will make you forget the chests and crafting tables. Overpowered Inventory 1.10.2 is a mod which is responsible for changing the player’s inventory to the extent that it is practically unnecessary to use both chests and crafting tables. Let’s see why. 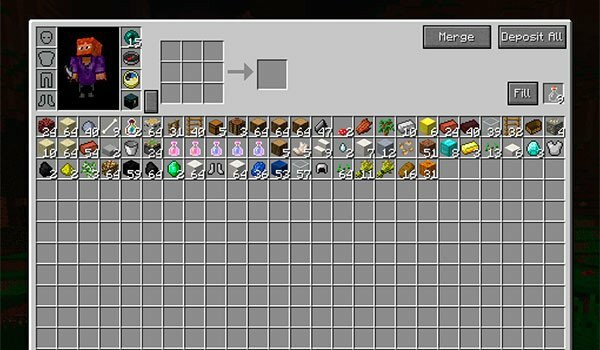 This modified inventory has a capacity of 375 checkboxes, while the normal inventory in Minecraft, is 27, so I can forget the chests. Also at the top of this new inventory we will have a space for crafteos, so no need crafting table. An inventory so big capacity can be chaotic, so in the lower right area of the inventory we have a series of buttons with arrows that allow us to sort the contents of our inventory. How to install Overpowered Inventory Mod for Minecraft 1.10.2? You do not need crafting table or chests!